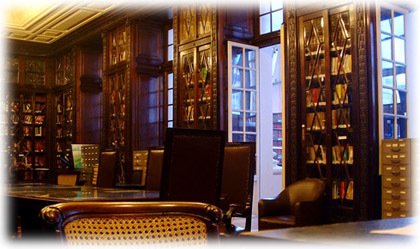 Home » Antiques » What Do You Find in a Gentleman’s Library? What Do You Find in a Gentleman’s Library? Extraordinary objects could be found in a Victorian or Edwardian gentleman’s library. What do one of Churchill’s cigars, a 35 million years old fossilised giant pig, a silver wheelbarrow presented to W.E. 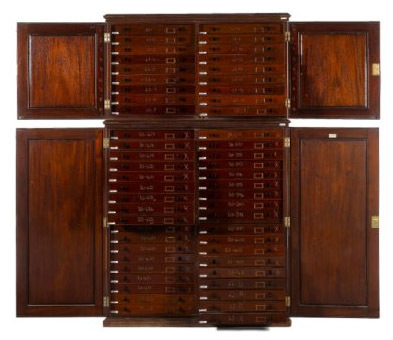 Gladstone, historic butterfly cabinets from the Natural History Museum and Christmas presents from the Duke and Duchess of Windsor have in common? They all feature in Bonhams annual Gentleman’s Library Sale on 19 January. During the war, portraits of Churchill were important propaganda tools but he rarely actually sat for them. In 1944 he did so, briefly, for the artist Frank O Salisbury who had already painted him many times. When the Prime Minister left, he discarded his half smoked cigar which the painter kept as a souvenir. It has been in the family ever since and is estimated at between £600 and £1,000. A perfect place to keep it would be one of the 46 collectors’ cabinets from the Natural History Museum. Until recently they held the world famous butterfly collections of three Victorian gentlemen who competed to accumulate the greatest number of specimens and the most impressive. They range in estimate between £300 and £3,000. The giant pig is among an array of fascinating and ancient fossils including a massive petrified tree trunk from the Triassic period, 235 years ago (estimate £5,000 – 7,000) and a beautiful large fossilised fish plate holding the forms of 26 perfectly preserved fish (£3,000 – 5,000). 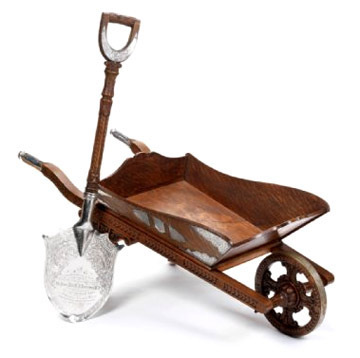 Four times Prime Minister, William Ewart Gladstone, was presented with the sliver wheelbarrow to commemorate his cutting of the first sod of the Wirral railway in 1892. It comes complete with spade and is estimated at between £20,000 – 25,000. There is a memento of another great Victorian in Isambard Kingdom Brunel’s Cigar Box (estimate £22,000 – 30,000). 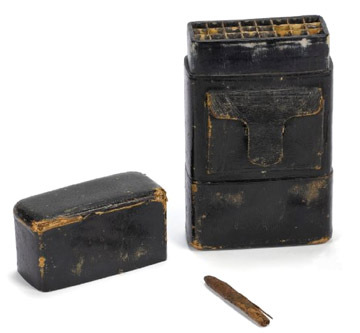 An inveterate smoker, Brunel got through up to 40 cigars a day and is often pictured, cheroot in mouth and cigar case strapped across his chest. Finally, Christmas presents from the Duke and Duchess of Windsor to their private secretary for ten years, Mr Victor Waddilove, are among a small archive of memorabilia connected with the controversial couple (£2,000-2,500) The gifts include a gold pen knife and a silver beaker, both engraved with the ciphers of Edward and Wallis. The Gentleman’s Library Sale is now in its 11th year. Unique to Bonhams, the sale features all kinds of objects that may have been found in a Victorian or Edwardian Gentleman’s Library from fossils to cigarette boxes, leather armchairs to globes, chess sets to family portraits. To deserve its title, a Victorian music room was furnished with a sympathetic understanding of the art it represented. The 19th century was a time when servants were plentiful and elegant dinners were served with much promptness and precision of detail with the help of the butler’s pantry. Various ways to decorate this over-looked area of the home. Tile Source recreates classic floor tiles with traditional clay and colored stains.